Balance Transfer Credit Cards: Are Brits Getting the Best Deals? Are Brits getting better credit card offers? Just when you thought the we had finally put the Revolutionary War behind us and made peace with those on the other side of the pond, we discovered that those in the UK are seeing some pretty lengthy balance transfer deals. Admittedly, those of us stateside may be having a a little envious -- and maybe even rethinking our loyalties? Brits winning the credit card war? Whatever your feelings regarding the events of 1776, there does, at first sight, seem to be a way in which Americans (in the form of our credit card companies) are today being beaten by the British. On March 26, the London-based Guardian newspaper listed some of the UK's best balance transfer deals, and, by current American standards, the introductory 0-percent APR periods were exceptionally generous, including ones for 24, 25 and even 26 months. Turn to the balance transfer credit cards listing on IndexCreditCards.com, and the story in the U.S. is very different. At the time of writing (and these things change frequently, so click through to see the situation when you read this) there are four credit cards offering an 18-month zero-percent APR, which is the best you can get. Others have introductory terms lasting 12, 14 or 15 months. Generally speaking, things aren't any better in our transatlantic battle on the balance transfer fee front. True (and, again, at the time of writing), one American credit card company is currently waiving that fee on one product -- and that beats anything the Brits are doing. But, on this side of the pond you can on average expect to pay perhaps 3 percent of any balance you transfer. In Britain, you may pay 2.9 or 3.5 percent on the very longest 25- or 26-month deals, but as little as 1.5 percent for 21 months of interest-free bliss. 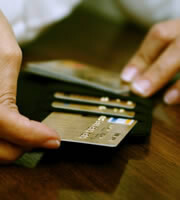 You may need an even better credit score than here to get the best balance transfer credit cards. You often receive a lower credit limit than you'd need to consolidate all your card debt. These lengthy interest-free offers could be a flash in the pan. Six years ago, the longest balance transfer period in the UK was 12 months. There are still plenty of "gotcha" clauses in British card agreements. That last point was illustrated in Money Box, a BBC Radio 4 consumer program, broadcast on March 23. One listener, Noël from Essex, had transferred a £560 ($850) balance onto his Tesco (the banking arm of Britain's biggest supermarket group) credit card as part of a six-month interest-free deal for existing customers. But he was charged interest on new purchases he made on the card -- but not the balance transfer -- even though he paid off those new purchases in full at the end of each billing cycle. It's not hard to make great offers if you then fail to deliver on what you apparently promised. Even so, those limey balance transfer deals do sound attractive. So does that mean American credit card companies should lower the stars and stripes on their headquarters buildings and instead hoist the union flag? The answer is a resounding no. Card issuers here may or may not currently be losing the Battle of the Balance Transfer, but they're certainly winning the credit card war. Last year, your blogger interviewed British payments expert Mark Jackson of Auriemma Consulting Group for a CardRatings.com article about card rewards. Mark was deeply unimpressed by rewards credit cards in the UK, complaining their programs weren't as innovative as American ones, and that the value of what they offered was significantly lower -- and continuing to diminish. Meanwhile, by most other criteria (interest rates, perks, consumer protections, customer service…) American plastic tends to be either better or comparable. So, 2013 for the credit card industry looks like 1776 did for the nation: a decisive American victory. 0 Responses to "Are Brits getting better credit card offers?"